The George Washington University Presidential Fellowship offers high-achieving seniors the opportunity for professional development and a Master's degree at GW. 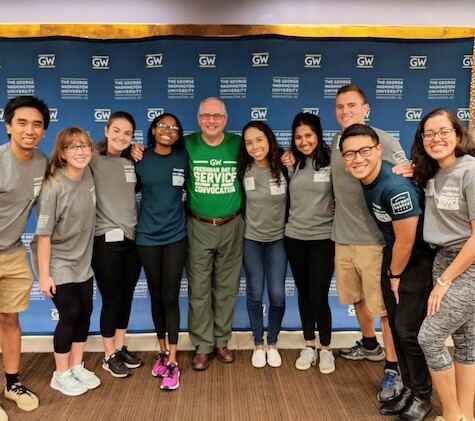 Founded in 1989, the Presidential Fellowship program requires a two-year commitment and fellows contribute to the advancement of the GW community by serving as ambassadors through their academic, professional, and personal involvement. The fellowship is designed to ensure that classroom education, professional experiences, and interactions with staff and administrators complement each other to provide training and practice in leadership and administration. Presidential Fellows work to make an impact on the GW community through active participation in community service and university events, ambassadorial attendance at functions, involvement in professional and personal development activities, and the development of meaningful relationships with GW students, faculty, administrators, and alumni.